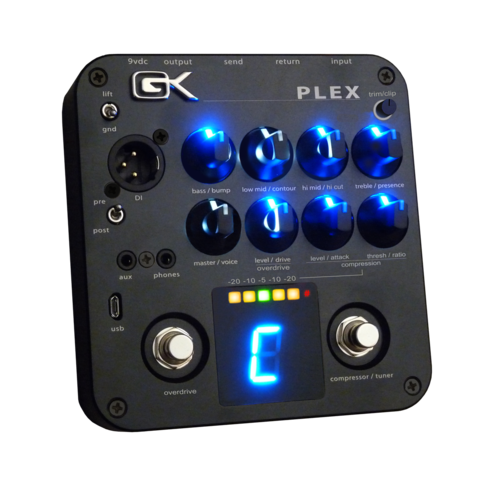 The GK Plex preamp ...... combines 47 years of amp design experience with state of the art technology to deliver the flexibility today's musicians require. The heart of every GK product is the active 4 band “variable Q” equalizer and contour circuit that set the standard for bass tone shaping over 30 years ago. Building on this proven foundation, the PLEX features expanded filter options that allow you to further dial in your instruments unique voice. Foot switchable Compressor and Overdrive ensure your performance blends seamlessly into the band or cuts through a crowded mix and the Chromatic Tuner makes sure it’s all in tune. The ¼” output drives the front of your instrument amp or power amplifier while the DI output sends it all to the PA or recording console. Aux IN and Phones Out make the PLEX ideal for jamming along silently with your favorite tunes and the USB input/output allows pristine digital recording and re-amping capability when used with your favorite recording software. Expanded Voicing Options: Every knob of the PLEX features push activated functions that allow the user to tailor every nuance of their sound beyond the range of traditional tone controls. As each knob is pressed, the indicator is lit blue to signify that an option is engaged and the readout displays the current option level that is active. Need more low end thump? Push the bass/ bump knob to engage multiple levels of bass enhancement. Scooping out some mids for the ultimate slap tone is as easy pressing the low-mid/contour knob until you find just the right notch. Get rid of excessive pick noise and click by pressing the hi-mid/ hi-cut knob. Add just the right amount of “air” to a dark instrument or speaker via the presence function accessed by pressing the treble/presence knob. No amp? No worries: Obviously, the pedal board friendly format, distortion, compressor and chromatic tuner with large LED display make PLEX an “all in one” extension of your existing live amp rig. But let’s face it, not every session or live performance has the need or capacity to allow for your favorite GK rig running at gig volume. The convenience of tracking direct and the use of in-ear monitors on stage has many players leaving their amps at home. With its world class preamp and virtually unlimited tone shaping, wide range of analog and digital input/output options, PLEX allows you to have your GK sound even when an amp is not in the cards.